Cattaneo Commercial have secured the letting of the first floor of 14 Princeton Mews, 167-169 London Road, Kingston upon Thames, Surrey KT2 6PT to Infoshare Limited. The premises comprise an excellent modern, new refurbished office suite of approximately 1,416 sq ft with 2 car parking spaces. 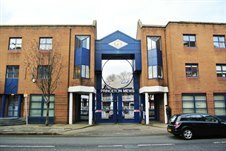 If you have office space you wish to let or sell, please contact either Andy Armiger or David Keates on 020 8546 2166.